Vince Pierson leads a session at the 2018 Baseball Winter Meetings on Minor League Baseball's diversity initiative. The goal of this series is to spotlight the people, programs and stories in the baseball industry that champion diversity and inclusion and advance the mission of Minor League Baseball's diversity initiative. In recognition of Black History Month, every week in February, we will profile a black leader in our industry, starting with Minor League Baseball's Director of Diversity and Inclusion, Vince Pierson. Vince Pierson has quickly made a name for himself in the sports industry and has helmed Minor League Baseball's diversity initiatives for four years. I sat down for a conversation with Pierson to better understand what motivates him, what it's like being a part of a growing number of black leaders in our field, and how he works to boost Minor League Baseball's diversity initiatives. Pierson plays a direct role in cementing MiLB as the cultural destination in sport and entertainment and ensuring that all communities are represented in the boardroom and the ballpark. We began our conversation discussing Minor League Baseball's industry-wide workforce and how we as a league can help motivate and elevate minorities in a variety of roles. Pierson was quick to push back on the narrative that it's an assumed lack of interest causing the problem. "I think it's important that we - the baseball industry - focus on how we can make our industry more accessible and appealing to women, racial minorities and other underrepresented groups. Many times, we assume a lack of interest when there could be a lack of effort on our part. We have to do more to create genuine touch points with our industry and our game." How do we create these touch points? Pierson follows both a macro and micro approach. "It's one thing to be invited to attend a game but quite another to be invited to get behind the scenes and see the operations that make the game possible or sit down with the team president or general manager and hear about what it takes to work in this industry," Pierson said. "This work is and always will be personal, and to advance the message most effectively, it needs to remain personal. Of course, that doesn't release us as leaders of our duty to be strategic in how we get the work done, it's critical to meet people and industries where they are and move forward methodically." Pierson has embraced this on a micro level with mentorship, and he argues that mentorship is dually a responsibility and a privilege. "I make it a point to make myself available to young people who are interested in pursuing a career in sports. It's not uncommon for me to set aside time for three to four calls in a single week devoted to mentorship. I'm fortunate to have mentors who I continue to learn from, so I know how important this can be for one's professional development," he said. As a minority mentor, Pierson's influence is inherently heightened, particularly when working with fellow minority youth. Representation is critically important, and it's important for young people to see physical proof that stereotypes don't have to dictate the path you take. "It is not lost on me that as a black executive on the business side of sports, I have an opportunity to show and prove to those behind me that we have a place in this industry that goes beyond the playing field," said Pierson. On a wider level, the role Pierson holds with MiLB, the sports league with the largest demographic reach - 160 different markets, to be exact - his positioning and strategy carries a large impact. An unapologetic and tenacious spirit might describe Pierson's personality best, and it can be seen in his goals which include a desire to increase the racial minority and female employee representation across the league. "We need to shift the makeup of our industry-wide workforce and do so in a way that changes the way we do business. 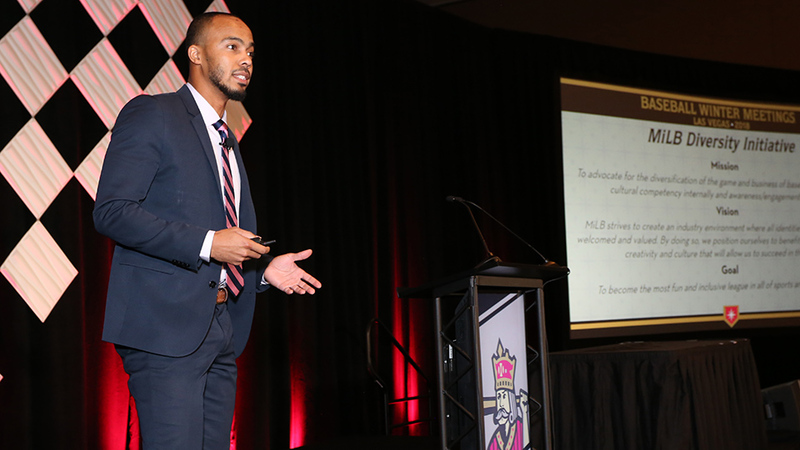 That means creating the type of buzz around Minor League Baseball that attracts top diverse talent and getting that talent into positions where they are heard and can make a real impact," said Pierson. Pierson has been empowered in his role and has brought much needed change in the short time he's been involved with the league, and he shows no signs of slowing down. He credits his ability to influence so much change - whether it be launching the MiLB FIELD Program, assisting with the Copa de la Diversión platform, implementing educational programs or countless other projects he's worked on - to the leadership from the top, the President of Minor League Baseball, Pat O'Conner. "I don't take for granted that our President & CEO voluntarily and proactively launched this initiative several years before I was brought on to manage it, and he continues to use his voice and position to advocate for its progress," said Pierson. "Working closely with all department heads within our office has allowed diversity and inclusion to be a part of every conversation rather than operating in a silo within the company." Change is a team sport. To enact change, whether it be in diversifying our workforces, our leadership or our fanbases, it takes a conscientious, all-hands-on-deck effort. It's about creating equal opportunities for everyone, and with leaders like Pierson and O'Conner, we're starting to see signs of progress in Minor League Baseball. But the statistics make it equally clear that there's still a long way to go, and you don't need to have a title like Pierson's or O'Conner's to make a difference. Benjamin Pereira is an associate at Minor League Baseball. This story was not subject to the approval of the National Association of Professional Baseball Leagues or its clubs.